This is a follow up article on our previous article which presented recent genetic evidence to refute AIT. We will point out common misconceptions prevalent on the internet which stems from the facts that either AIT enthusiasts willingly ignore new evidence or cherry pick few studies that suit their narrative. The example of such misinterpretations can be found even on some of the Hindu RW blogs such as this. This is a recent but long winding article by MT and mixes various evidences. But it makes sense to stick to genetic studies as according to the same author archaeology does not matter for studying population migrations as “pots don’t speak”. Also, for now we will stay clear of the linguistic arguments as they can be almost often made either way in favour of AIT or OIT. For those who wish to read more on linguistic arguments in favour of OIT can follow the research work of Srikanth Talageri or any other leftist historian for understanding the other side. For those who find it difficult to go through this entire blog post can directly jump to the bibliography section in the end to understand that most of the quoted research material is old and in some cases patently wrong for explaining the genetic movement of the populations. In all the cases, MT uses genetic studies which show that there is similarity between Indians and Europeans but none of those studies put a time line on the connection. This has unfortunately become a favourite tactic of the AIT enthusiasts to use half-baked scientific truths to peddle their outdated fiction based on old genetic studies. This whole AIT defence was built on the assumption that the migration happened only from Caucuses to India and not from India to Caucuses. Unfortunately the recent genetic studies are poking many holes in this theory. The old genetic studies were limited by the resources and could tell about shared ancestry but could not put a time line on the direction of migration; the newer genetic studies however could answer both. In fact, the latest genetic studies published took full cognisance of the proposed Aryan migration into India from Russia as well as OIT. But after analysing the genetics comprehensively with a larger, wider and deeper samples across all populations, the most recent genetic study came to the conclusion that Punjabi R1a1a Y haplotype is the oldest among the Indo-European population and is likely to be the origin of the Indo-Europeans. The time line of the genetics of the population is given by the SNP (single nucleotide polymorphism) of the R1a1a alleles. Out of all the population groups studied from all over the world, Punjab showed the highest frequency of SNP variations and hence is likely the oldest population group among the studied populations and that the frequency of variation decreased from Punjab towards the Western European population with the lowest frequency of variations in the Western most and northern most Europeans (not lowest frequency of R1a1 but lowest frequency of variations in R1a1a) with mid-level of frequency variations in the Caucasus region, clearly indicating that Caucuses is not the origin of Indo-Europeans as the AIT fanboys want to believe (Read our previous article to check the sources and how SNPs are used for determining the age of population based on frequency of variations). Also, notice that the above studies also explain why North Indian population have so much more in common with Europeans than south Indian population, because it was north Indian population which migrated towards Europe. Also, notice that north Indian population is composed of 60% ANI and 40%ASI and South Indian population is 60% ASI and 40% ANI. This mixing creates some confusion and usually AIT proponents use it to claim that ANI represents Aryans. But it is not true. ANI migrated into India around 45000 yrs BC and ASI migrated into India around 60000 BC and ANI and ASI are not synonymous with Aryans and Dravidians as AIT proponents want you to believe. So, if we compare the present day genome of north Indian population(with their 60/40 ANI/ASI) split with Europeans, you will find more similarity between North Indians and Europeans just in accordance with migration out of North India. But here is the kicker, South Indians also have genetic materials in common with the Europeans. There is a common myth perpetrated by MT in his blog that the ASI genes are not found in Europe. This is patently false claim and show poor understanding of what ASI means. There is no such thing as an ASI gene or ANI gene. The ASI/ANI is just population reconstruction models and are not specific genetic materials to claim ASI genes are not found in Europe. The study by Lucotte G. points out the same fact in its conclusion, i.e. the Indo-European population (by virtue of frequency of variations in R1a1 SNP) is 15000yrs old in the Punjab plains, 11000 yrs old in central Asia, 11000 in Caucuses , 7000 in Scandinavia and Western Europe. 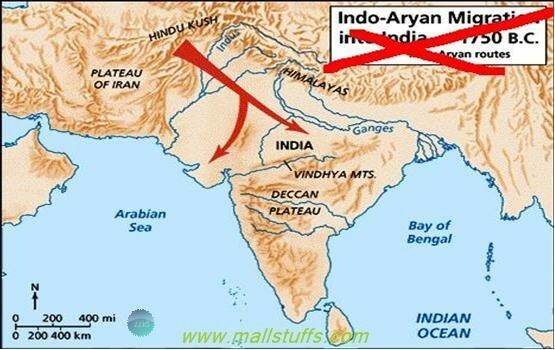 So all in all, AIT enthusiasts are just trying to use half information from out dated genetic studies to peddle their out dated fiction called Aryan invasion theory, just based on genetic similarity between North Indians and Europeans, when such similarity can be explained as well by North Indians migrating to Europe. And unlike AIT, this theory actually has newer genetic evidence to back it up without having to go through logic fallacies like why Europeans would migrate towards India, just when ice age was ending, while Indians could have migrated up north as north got warmer when ice age ended. Another common mistake which gets repeated in the above blog is that it uses two parameters lactose tolerance and tallness gene to somehow corroborate AIT. This is patently absurd as both lactose tolerance and tallness gene result in survival advantages to the population and hence cannot be used for studying natural flow of population. Does it come as a surprise that all genetic studies use SNP, which don’t give any survival advantage instead of genes which do give some advantage? But why? Let’s say a population of mixed tall and short population from Punjab has to cross the Steppes of Central Asia to go to Europe. Steppes being more hostile environment to hunt would have a huge selection pressure towards taller population. So, when the population crosses Steppes, tall population would be selected against the short and when the population reaches Europe, it will be almost entirely tall. So, genetics of European population of the same group which started from Punjab would have more tallness genes than the parent population of Punjab. Now let’s reverse the scenario where Europe is the origin of the tallness gene and it crosses Steppes into Punjab. But now, since most of the population in Punjab is already short or mixed(as per AIT), the invading /migrating Indo-Europeans with their tall genes would mix with the short Punjab people. But here, the Punjab plains is not as hostile as Steppes and might not have the same selection pressure towards tall gene and hence the tall genes will get diluted by mixing with short people in Punjab. So, if you analyse the Punjab population now, it will have mixture of short and tall genes and not tall genes or short genes alone. So in both scenarios involving the tall genes, both Punjab population has short and tall mixture population and Europe has tall population. But genetics can be used to explain why it might be so in both migration from Punjab to Europe or Europe to Punjab because of the survival advantage/selection caused by migration through Steppes. To summarize, tallness gene distribution cannot be used as a tool to study migration direction, as it can’t provide definitive answer to the direction of movement and can only say that movement might have happened. It is also the case with lactose tolerance genes. This is why population genetics and migrations studies are done using SNPs which don’t confer/alter survival benefits and are neutral w.r.t. such issues. MT further talks about vitamin D requirement which may have selected Indo-Europeans fairness. In fact this again can be explained in the same breadth as tallness- Indo-Europeans migrating to northern parts of Europe would be selected for fair skin due to their demand for vitamin D due to poor light in northern Europe compared to Punjab. All in all, AIT enthusiasts have limited number of days to enjoy their falsehoods as new genetic studies will settle this debate once and forever. The fact that AIT was broadly accepted theory in most circles forced the earlier genetic studies to match their findings and present their results to corroborate existing consensus. This happened as genetics could not speak about migration direction 10 yrs ago. But it has changed now and we should see definitive and conclusive answers in the future.